So, fast forward nine years, and I’ve published thirteen novels. I’ve sold half-a-million books. My dream came true. Well…sort of. Being in print was cool, no doubt a blessing from God. But it came with an aftertaste. I thought sure the money my books brought in would make it possible for me to be a full-time writer. But it wasn’t even close. I mean, it wasn’t in the same zip code. Don’t get me wrong. I love teaching (my day job). I’ve taught 6th graders for 22 years now, and they are incredible kids to work with. But I also have four kids of my own (now teens) and a lovely wife who, for some unknown reason, actually likes to spend time with me. Trying to juggle teaching and writing and family always made me feel like something needed more. If I was working on lesson plans, I felt like I should be writing. If I was playing ping pong with the kids, I felt like I should be working on lesson plans. I also felt like the time constraints left me unable to truly give my best to any one thing. That’s tough on a creative type. Know what I mean? We’re our own worst critics, and our perfectionism is pretty close to psychotic. All that work—soul, sweat, and tears—and the money just wasn’t there to focus on one career. I really don’t want to sound ungrateful. My publisher went out on limb to sign me from nowhere to a trilogy deal. But in the end, traditional publishers just don’t give authors a high enough percentage of the royalties to make ends meet. Seriously, my wife—the financial guru of the family—broke down all my royalties, and it turned out I was making around .72 per book sold. That’s seventy-two cents per book. That’s all. No wonder. I get that publishers have a lot of mouths to feed: editors, typesetters, proofreaders, cover designers, marketers, etc. But that low a percentage is pretty much exploiting the artist, just like record companies did back in the day. Sickening, really. The artist is responsible for the story…and yet, the author gets a sadly small piece of the pie. So you can bet that I’ve been profoundly interested in Joe’s journey into eBooks. Every time he posted about the success he was having, I kept thinking: I have GOT to get into self-publishing. Amazon offers 70% royalties, are you kidding me? If I had made that on all my print books, I could have quit teaching AND my wife could have quit her job! 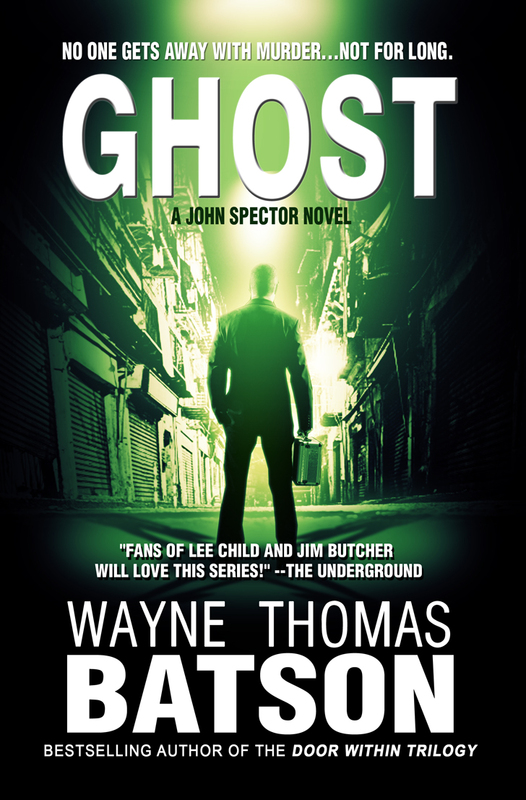 Now, here I am in 2013, almost ten years after my first contract, and I’ve released GHOST, my very first solo eBook. It’s a supernatural thriller that I think fans of Lee Child’s Jack Reacher and Jim Butcher’s Harry Dresden books will like. John Spector, aka GHOST, isn’t your ordinary investigator. He carries a shiny badge, a billfold ID, and a mysterious silver suitcase. His mission? Seek the forgotten ones, the abandoned ones, the ones no one else can or will help. Visit blunt force trauma upon the world’s blackest souls and deny the devil his day by any means necessary. And never stop. Never. For more than a decade, the "Smiling Jack" killer has been posting photos of his victims on the Web, daring anyone to catch him, daring anyone to care. But when no missing person files match and no victims are ever found, the FBI closes the case. Years later, a digital camera washes up on shore, and GHOST finds it. Each macabre photo becomes a clue that will lead GHOST and FBI Special Agent Deanna Rezvani on the trail of one of the most diabolical killers of this world…or beyond. "No one gets away with murder. Not for long." I’m already working on book 2 of the John Spector GHOST Series. It’ll be called “Minister of Fire,” and likely be out Summer 2014. I have ideas for at least two more GHOST books, so I’m hoping the books will sell well enough to make a nice, long series. Before I go, I’d like to do two more things: a “give back” & a challenge. 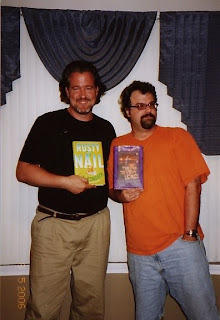 When Joe was back in his Pre-eBook days, the man went nuts and toured like 10,000 bookstores all across the country. Seriously, every day on his blog was like “Where’s Joe Today?” During his Maryland swing, Joe actually stayed a night in our guest room. He claims to have stolen some silverware. Not sure about that. But while in town, Joe allowed me to tour the Maryland bookstores with him. During that 12-hour tour, we had a lot of driving time to talk about stuff. We also realized that our reading audiences were quite different. Joe wrote thriller/horror mainly for adults and wasn’t afraid to be explicit. 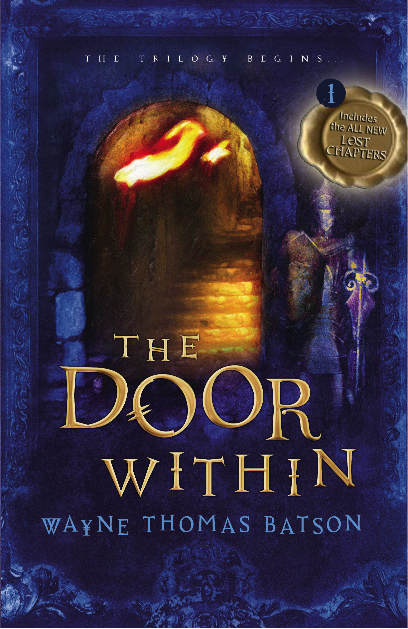 I wrote Young Adult Fantasy and Adventure for a Christian Publisher. And I got to thinking that it would be very, very cool to coauthor a book where our different worldviews and audiences ran into each other. So, Joe, I challenge thee! Let’s get Jack Daniels and John Spector together, at least for a novella…and see where it goes. What say you? I don’t mean to put Joe on the spot. I know he’s got more projects and offers than he has time for right now, but I wanted to throw that out there. And lest you hear that I’m a Christian author and think, “Ewww, one of -THOSE- weirdo, right wing nutballs,” rest assured: we Christians are crazy, but maybe not the way you think we are. My books aren’t preachy. I learned very early that you can’t write a sermon and just throw Elves in and call it a fantasy novel. The story matters. Are there Christian themes in my books? Absolutely. But they come organically from the heart of a writer in much the same way that every other writer puts a bit of themselves into his/her stories. It’s no different. Every author has biases, beliefs, and certain life-lessons. And they come through in the stories they write. The question is: is it a good story? I try hard to make sure my stories will entertain. I hope I’ve succeeded. But, thanks to eBooks, the readers get to decide. Thank you, Joe, for supporting Tess’ efforts in the fight against Alzheimer’s. My wife’s father suffers from Alz, and it’s very hard to watch such a good, kind man laid low like that. I sure hope a cure is found soon. Thanks for letting me spend a guest post day here at Newbies. Have a GHOSTly evening, all. Addendum: This post is now superseded by my Kindle Worlds terms. I am no longer collaborating under the terms of this post, but please check out my website for details on how to write in my universe. Joe sez: So far I've collaborated on many projects with authors I like and admire, including Ann Voss Peterson, Blake Crouch, Henry Perez, Jeff Strand, Tom Schreck, and F. Paul Wilson. It's been a lot of fun, and we've all made some good money. Which got me to thinking. So far, my collaborations have been 50/50. We each write half, and split the profits equally. Right now I'm working on several projects, and I don't have time to fully collaborate with someone new. But what if I franchised Jack Daniels? Following the James Patterson model, I could let another writer do the lion's share of the work. 1. Test out new writers by having them do a Jack Daniels short story, teaming Jack up with a character from their series. 2. The writer writes the story, without input from me. If my wife likes it (she's my first reader and knows my universe better than I do), I'll do the rewrite and editing, pay for the cover art and proofing and formatting, and then publish the story through my agent, Jane Dystel. Jane will pay us monthly and provide royalty statements. She'll also seek out interest in audio and foreign rights. 3. If my wife doesn't like the story, the writer can self-publish it without me, changing the names of my characters. So Jack Daniels would become some other female cop, and the writer would have full rights to the story. I have a large fanbase and some decent name recognition, and this could give a lesser-known writer a boost, both in sales and in potential fans. If readers like the story, they'd be inclined to seek out other books by the writer. I ran this idea past one of the authors who did a guest post here, Tracy Sharp, and she liked it. Our story should be out in September, and maybe a novel is next. So to answer your question, Wayne, I've got a lot on my plate right now and can't collaborate with you. But if you'd like to write a Jack Daniels/John Spector story, go for it and we'll split the profits. That also goes to anyone reading this. If you want to team up your character with Jack (or anyone in the Jack Daniels series) then write the story, send it to me, and my wife will decide if I publish it. Now let's do a Q&A. Q: Joe, this sounds like you're becoming a publisher. A: It's sort of a weird hybrid of publisher/franchiser/co-writer/licensor. A: It seems win/win. A new author gets to piggyback on my success, and I get to make money off my brand. Q: Why is your wife doing the reading, not you? A: First of all, because I don't have time. Second, because she'll insulate me from what I'm guessing will be a lot of submissions. That way, if she rejects a story, I'm not the bad guy. Third, because my wife loves the Jack Daniels universe, so she'll know what works and what doesn't. Q: Who owns the copyright? A: I'll share copyright with the co-author. The co-author will own the characters they create, I own my characters. Q: Will you offer a contract? A: Yes. A simple collaboration agreement, saying a 50/50 split after my agent takes her commission (10%). So for a $3.99 ebook novel, we would each get $1.20, my agent would get 40 cents, and Amazon would get $1.20 (at 70% royalties). For a 99 cent short story, we would each get 15 cents, my agent would get 5 cents, and Amazon gets the rest (at 35% royalties). Q: Do you own the rights? A: No. The rights are shared equally. If either party wants out of the agreement, they can cancel the deal at any time and get their story back (with my characters renamed or removed. Q: Why are you taking half? Isn't that a lot? A: I'm paying for the cost of publication, and I'm the one who sold hundreds of thousands of Jack Daniels stories. Half is less than what James Patterson makes with his co-authors. Half is also less than what publishers take. Q: If your wife rejects me, can I rewrite and resubmit? A: No. If you're almost there, she'll tell me and I'll send the writer some editing suggestions. But she's not going to read the same story over and over again. So send your best work the first time. Q: If you accept my story, how soon until it gets published? A: Depends on how much I've got going on. Hopefully it will be quick--in under two weeks. Q: Do you have any writer's guidelines? A: No. Write whatever you want to. But remember that it should fit into the Jack Daniels universe. If it doesn't, my wife will reject it. So if this is something you're interested in, read my eight JD novels and the short stories and make sure you've got the tone and voice right. Q: How will you pay? A: Monthly, after Amazon pays my agent. Either direct deposit or check, whatever is preferred. Q: Will you share your royalty statements? A: Yes. My agent will send monthly royalty statements. Q: If there a length minimum? A: No. Stories up to 8000 words will be priced at 99 cents. Between 8000 and 50,000 words will be priced at $2.99. Over 50,000 words will be $3.99. Q: What about cover art? Will the co-author have a say? A: The Jack Daniels series is a brand, and the brand has a certain look. So I pick the cover and title. 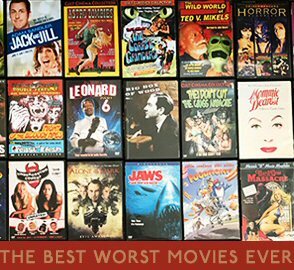 That doesn't mean I won't listen to suggestions. I'm pretty laid back and easy to work with. Q: How big will the co-author's name be on the book cover? Q: When should I contact you? A: When your story is finished and perfect. Email it to me as a MS Word doc attachment, with JACK DANIELS STORY COLLABORATION as the header. Q: How soon will I hear from you? A: My wife is going to try to read the stories the day they are sent to me. She's psyched about this. Q: Does it have to be Jack Daniels? Can I use another character instead? A: Yes. You can use any of my characters I created, including my Jack Kilborn books. But don't use any characters in books I collaborated on. (For example, you can't use Chandler, whom I created with Ann Voss Peterson, or Luther Kite, who belongs to Blake Crouch). Q: Can I drastically change your characters? A: You can do whatever you want. But remember these characters already have a set in stone timeline, a past, and a future. If you cut of Jack's legs, or give her three kids, or do anything that changes her past or future or doesn't fit into the sequence of novels, don't expect an acceptance. A: I'm not doing any hand-holding for this, and I don't have the time to answer emails. All the answers are here in this blog entry. Read my books, and if you write a story my wife likes, we'll be partners. If my wife doesn't like it, you own the story and can publish it yourself (without my characters). It's that simple. Now go for it.